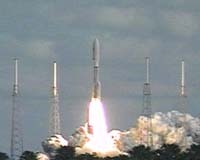 NASA's New Horizons 3-billion-mile-plus mission to the outer solar system finally got underway Thursday when the half-ton spacecraft executed a picture-perfect liftoff from Cape Canaveral Air Force Station in Florida at 2:00 p.m. Eastern Time atop an Atlas V booster. It is expected to rendezvous with the planet Pluto and its moons sometime in mid-2015, and perhaps even to visit the mysterious objects in the Kuiper Belt that extend well beyond Pluto's orbit. 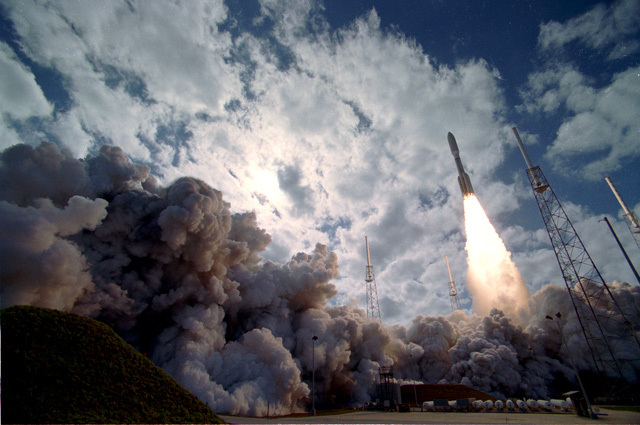 Carrying the spacecraft, its Centaur second stage, and a unique third-stage Star-48B kick motor into space, the Atlas produced more than 2 million pounds of thrust at liftoff and cleared the four surrounding 350-foot lightning towers in under five seconds. I was wasting time at work watching the launch. Fun fact: the Original Atlas missle was the first US ICBM. I think it may have been desined without any input from the Von Braun team. It had many new design ideas that the German rocket guys had never thought of. The Atlas 5 rocket now uses Russian engines. What a difference 40 years can make. Guy Noir wrote: What a difference 40 years can make. It could have made more. It could have made 120 years worth of difference, but then we'd all be dead. Now that there's a mission to Pluto, when will there be a mission to Goofy? DrMatt wrote: Now that there's a mission to Pluto, when will there be a mission to Goofy? Doh already took care of that when he sent his cult to the spaceship in the comet's tail. Shows current location of New Horizons probe. Updated hourly! Wow, they're taking it straight out. That must have been a heck of a burn to get it going like that. Remember how the Cassini mission used gravitational resonance with Venus to get going fast enough to reach Saturn? A straight shot out to Pluto makes me think the thing will need a heck of a retrorocket burn to actually catch a decent glimpse of Pluto as it zooms by. It looks like if they wanted to, they could have sent the thing to Venus and it would be crashing there later this week already. That's fast! There will be a bit of "gravity boost" when it flies by Jupiter. Just bumping this thread because I think it's cool that we can hurl a probe past lunar orbit in 8.5 hours and martian orbit in just 76 days. Per this link "New Horizons will cross the red planet's orbit on April 6, 2006". That just seems cool to me. Abdul, please start the 30 day countdown. swellman wrote: Abdul, please start the 30 day countdown. We can't add hacks, can we? One of those countdown clocks one sees on the travel site boards would be nice. Abdul Alhazred wrote: There will be a bit of "gravity boost" when it flies by Jupiter. Whooeee, that thing is ripping right along, too. How long until it crosses Mars orbit? ETA: Never mind, I see the answer! Please do not interrupt the countdown. It takes a lot of concentration. Some NH space geek trivia and commentary can be found here. - The journey will take precisely 3462.7 days, i.e., from 19:00 UTC on Jan, 19, 2006, to 12:00 UTC July 14, 2015, to reach Pluto. - NH was inside 1 Astronomical Unit (AU) until late on Jan. 29 UTC, therefore it was an inner planet mission for the first 10 days. - NH will pass the orbit of Mars on April 8, just a little after the Mars Reconnaissance Orbiter got there - and MRO had a 5.5-month head start. - Closest approach to Jupiter will occur at approximately 6 hours UTC on Feb. 28, 2007. Closest approach distance will be 32 Jupiter radii. Orbit encounter information for Saturn, Uranus and Neptune will be added when it becomes available.